A Tata car showroom in Mumbai. This time of the year offers the best chance to offload vehicles because traditionally it’s the buying season for big-ticket items. Mumbai / Delhi: Ajay V. Deshpande, a 46-year-old chartered accountant, has just bought a brand new Tata Indigo. 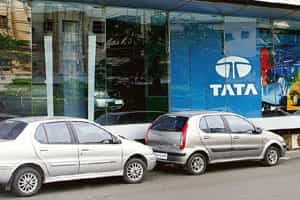 A loyal Tata customer, he used the discounts offered during Dussehra to replace his three-year-old Indica, a cheaper offering from the same company. Deshpande traded up even though he had intended to purchase another Indica,because the offer was hard to resist. “I traded in my old Indica and also received a cash discount of Rs40,000 on the new Indigo, which I bought for close to Rs5 lakh," he said. While a brand new Indica would have cost him at least Rs3.4 lakh without discounts, an Indigo would have cost him Rs5.4 lakh on the same basis. With sales slowing from a sharp spike in lending rates, that have risen by as much as four percentage points in the past three quarters to a five-year high, vehicle makers are pulling out all stops to get rid of bloated inventory and sell out existing models so they can start on a clean plate with new models next year. The rate hike has already caused a 5.9% year-on-year drop in sales of all vehicles in the first half ended September, pulled down mostly by weak two-wheeler sales. But the festive season offers the best chance to offload vehicles because traditionally it’s the buying season for big-ticket items. “The growth in new cars this year is largely accounted for by new launches," said Sumit Bali, chief executive, Kotak Mahindra Prime Ltd, the passenger vehicle-financing arm of Kotak Mahindra Bank. Sales in the first six months of this fiscal show that it’s mostly new models that have been able to ride out the sales slump in a country where 60% of motorcycle and 85% of passenger car purchases are financed by banks or financiers. “This suggests that manufacturers who anticipate consumer trends, have distribution depth and have new products to offer would benefit," Bali said. Mahindra & Mahindra, which was among car makers that saw sales rise, gained largely from newer models, such as the Logan. “We are expecting a better performance for both our utility vehicles and the Logan passenger car during the festival season," said Pawan Goenka, president, automotive, Mahindra & Mahindra. In order to boost demand and trim inventory, vehicle makers have so far this year lined up hefty rebates, almost unseen this early in the season in previous years where they couldn’t keep customers away. In the first six months (April-September 2007), passenger vehicle sales rose 13% while sales of motorcycles were down almost 9.5% year-on-year according to figures from the Society of Indian Automobile Manufacturers, performing worse than previous years. Several dealers said vehicle manufacturers are not giving up on the discount push and some said it’s helping pareinventory. “More people are turning up at the showrooms and enquiry levels have increased," said Prem Bagga, president of the Automobile Traders Association of Delhi. “This has helped in picking up sales and the stock is moving fast." The rush to grab customer wallets is so intense that even newly introduced brandssuch as Spark, from General Motors, are offering discounts of up to Rs60,000,or about 16% of the ex-showroom price for the car that is six just months old. It’s managed to offload 10,000 cars in 10 days. “The Spark has done well in the 10-day programme," said Karl Slym, president and managing director of General Motors India Pvt. Ltd. “It has given us more than we had bargained for." Car makers such as Ford India Ltd are also riding the new model boom. “Players across the industry witnessed softening results in Quarter 2 (calendar year)," said Arvind Mathew, president and managing director, Ford India. “With the introduction of new models such as the new Endeavour, Fusion diesel and the recent Fiesta 1.6 Fida Edition, we expect a positive growth in sales during the festival period." But its sops will end by the end of the month. “No offer or discounts appeal to the customers if continued for a long period," he said. One reason for the deep discounts in this period is that vehicle manufacturers generally tend to clear up inventory of older models as the new year always brings out either completely new cars or refreshed models of existing vehicles. Other firms that make larger sedans are offering holidays to exotic locations, guaranteed buy-backs, cheaper financing, personal digital equipment, a year of insurance and other such goodies. Two-wheeler makers, too, have attractive incentives for customers, partly because while car sales have been growing, two-wheeler sales have mostly slumped. Hero Honda Motors Ltd, the country’s largest two-wheeler maker, is giving rebates ofRs2,020 on its 100cc CD-Deluxe and Rs2,400 on its 125ccSplendor NXG. Meanwhile, rival Bajaj Auto Ltd has announced a Rs4,000 discount on its 100cc bikePlatina, a segment it finds unprofitable and which it clearly wants to shift out of,by offering customers bikes with at least 25cc more engine capacity. “Our weapon is our new bike 125cc XCD, and we are on track to achieve sales of 50,000 bikes in October," said Amit Nandi, general manager, marketing, Bajaj Auto.